It’s easy to fall into the trap of thinking that you need engineers for growth tactics. Here are 5 you can implement on your own. I had been emailing back and forth with a reader. He asked me for advice about getting traffic, and I suggested he start a blog to attract readers. 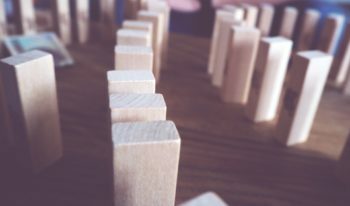 On the one hand, this is a clear example of “but I…” syndrome: a condition that I—and so many of us—suffer from, that sometimes causes our first reaction to a piece of advice to be thinking about all of the reasons why we can’t do something, rather than thinking about the ways we can. On the other, it’s a fair question. And the truth is, no, you can’t do exactly what those companies are doing right now. But there’s SO much you can do to grow your business that doesn’t require a developer or designer to lay a finger on. Whenever I sign up for a new product or service, I get an email welcoming me. Sadly, most of these welcome emails—especially those with nothing more than a short “subscription confirmed” message—miss a huge opportunity. If you’re going to have someone’s attention anyway, why not do something valuable with it? For both you and them? A warm, personal welcome from me. 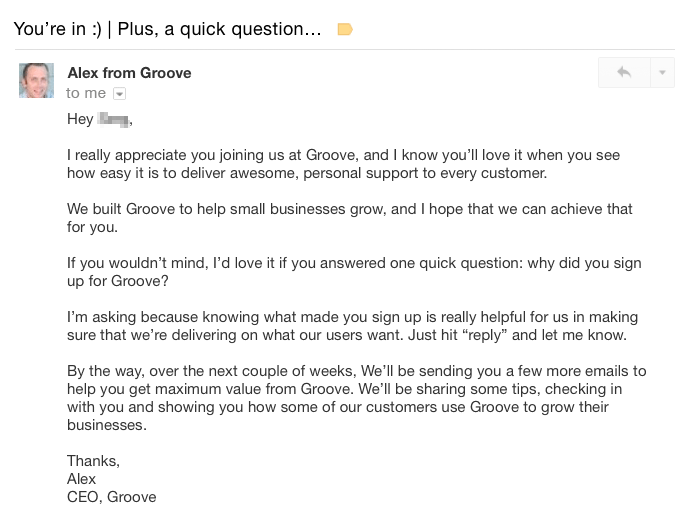 The responses to this email have been tremendously valuable to our growth efforts. That’s the kind of language that we’ve put directly into our marketing site and email copy, that speaks directly to prospects in their own words and that connects with them in a way that copy written based on assumptions never will. How to implement this without an engineer: Simply set it up as the confirmation email in your email software or CRM. If you don’t have any software to email customers set up yet, then simply save the email and send it by hand whenever a new customer signs up. 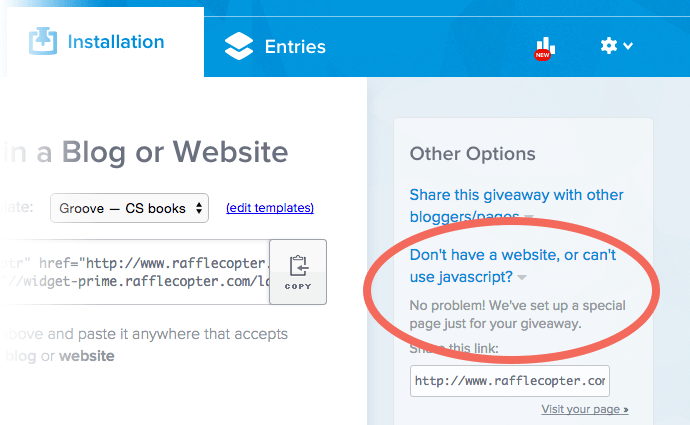 We’ve now run giveaways on all of our blogs. These have been hugely successful for us when it comes to collecting new email subscribers and driving traffic through Tweets and Facebook shares, as well as simply building the Groove community. Giveaways don’t have to be expensive; the 13 books we gave away cost us around $80 per set on Amazon, and that giveaway drew almost 1,500 new subscribers, at an amazing 9.8% conversion rate from the pool of visitors to the post while the contest was running. I’ve also seen successful giveaways for prizes that cost the contest promoter nothing but time, including one-on-one consulting and free design services (from a designer). You can do giveaways to get email signups, get people to share your name on social media, have people sign up to try your product and more. It might seem obvious, but far too many overlook the power of blogging because they imagine technical hurdles that really don’t exist. It’s easy to dismiss a blog if you assume that you’ll need to code blog posts yourself (we do this, but we certainly don’t need to… in fact our first blog was on Tumblr), or that you need fancy widgets and software to optimize. The fact is, to get started, you need absolutely none of that. On day one, you can start with no technical aptitude at all. Our blog has become the single biggest driver of growth for our business, and anyone can replicate those results with the right process. Figure out what your audience’s burning pains are. Talk to them. Do keyword research. Send out surveys. Write content that solves those pains. This is the part that comes least naturally for most people (myself included), but you’re more prepared to do this than you think. Just start. Seriously. Research your posts, use compelling images, tell stories. 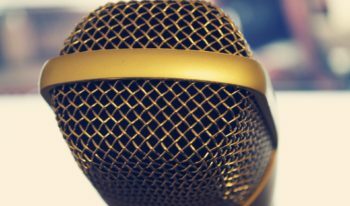 Drive traffic and build an audience of people who want to hear from you. This is the most time-consuming part, but it’s really, really straightforward. 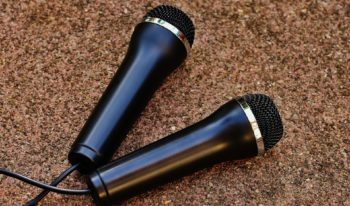 Get influencers on your side, write guest blog posts and collect email addresses using any number of free tools out there that don’t require a developer to set things up. Repeat. Do this over and over and over again, and if your product is good enough, you will get customers. Guaranteed. How to implement this without an engineer: Sign up for a free WordPress blog. It’s ridiculously easy to set up, has plugins for all email software that require zero technical knowledge to set up, and you can always switch to something more complex when you can justify the cost and developer time. What do you do with all of those new email subscribers? If you’re like most bloggers, nothing. You’ll send them updates when you publish new posts, and nothing more. But you’re not like most bloggers. You’re going to use your blog to grow your business. And that’s where your autoresponder comes in. Every mainstream email marketing software has the functionality to set up an autoresponder: a series of automated emails that gets sent to every new subscriber. Tell the customer what to expect from us in their inbox. Deliver high-value content that solves problems for the subscriber. Finish with a strong call to action to sign up for your product. Since implementing the current version of our onboarding email autoresponder for new blog subscribers, our 30-day subscriber retention has jumped by more than 25%. And the final email brings in hundreds of new trial users each month. 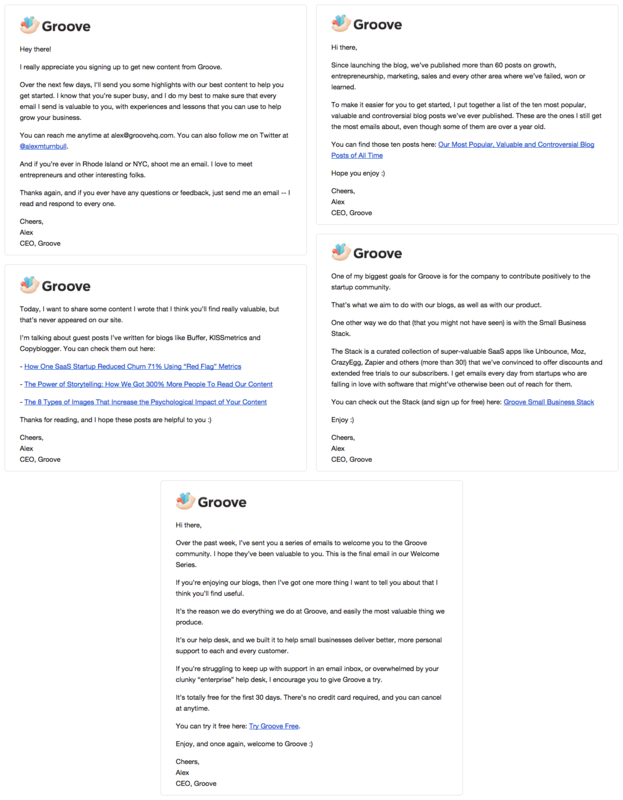 How to implement this without an engineer: Write the emails in a Google Doc, and set it up in your email marketing tool of choice. Some of the most powerful growth tactics we’ve implemented don’t involve actually signing up a single customer. 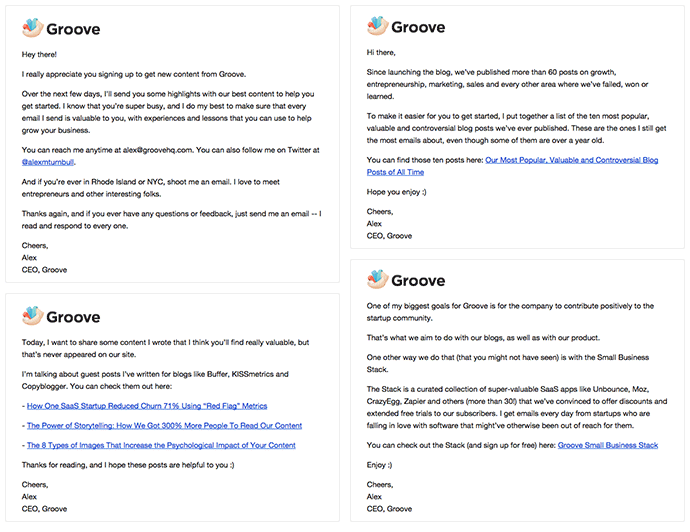 The welcome email is one example, and customer development is another. The 100+ hours I spent last year talking to all of our customers (and the many more I’ve spent since) have been some of the most highly productive hours we’ve spent on growth. If you haven’t tried a full-scale customer development effort yet, do it. Trust me. You’ll find the insights you need to grow like never before. 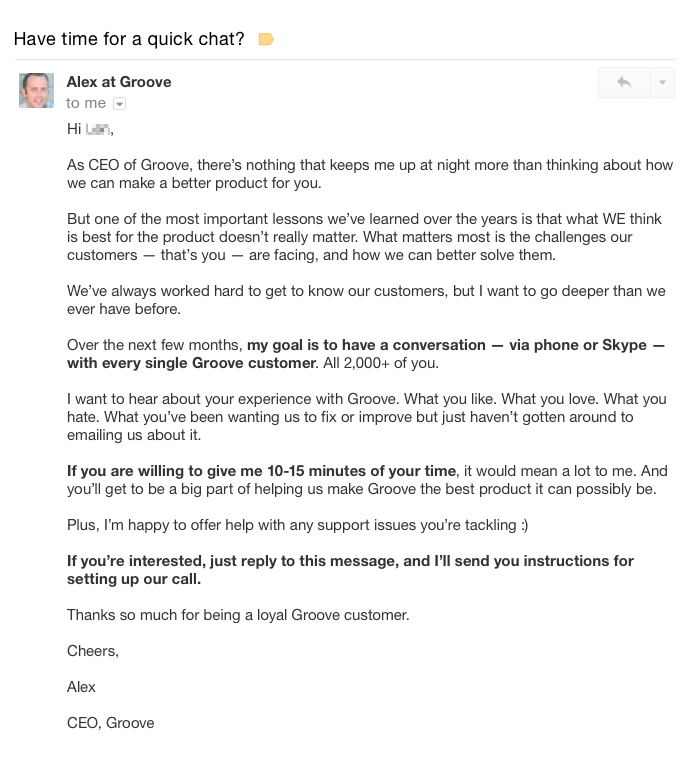 How to implement this without an engineer: Email your customers to set up a chat. You can use Doodle to manage scheduling, and a Google spreadsheet to track the feedback you collect; here’s the exact spreadsheet we use. In the early days of a business, everything is scarce, including everyone’s time. With every team member wearing multiple hats, people get stretched thin. But not having developers at your disposal doesn’t give you an excuse not to implement tools and strategies to drive growth. I hope that this post has given you at least a couple of ideas for tactics you can put into practice today.